"This canyon world where water yearns toward the ocean is a place so large I can’t take it in. Instead, I am taken in, traveling a near dream as we journey by water, contained by rock walls. In order to see this shorn-away world, I narrow my vision to the small and nearly secret. Never mind the stone’s illusion of permanence or the great strength of water. I look to the most fragile of things here, to the plant world of the canyon. The other river travelers seem taken in by stone, time, and water, and do not see the small things that tempt my attention, the minute fern between stones, the tiny black snails in a pond of water. I am drawn in by the growing life and not by the passing." The mystique of the Colorado River is no less enduring and powerful than is its physical presence in the landscape of the West. Little wonder that narratives about the Colorado still arouse and intrigue readers, or that the river continues to inspire new writing among contemporary authors. What is surprising is that no anthology offering a comprehensive introduction to these works existed - until now. 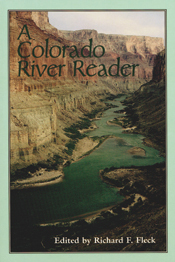 A Colorado River Reader spans hundreds of years and many cultures and voices to capture an array of responses to this mighty river and tributaries. The collection opens with a Paiute creation myth set in the Grand Canyon and progresses through time, encompassing the Spanish and American exploration narratives of the eighteenth and nineteenth centuries and culminating in the adventure and nature writings of the twentieth. This is a book that deserves a place next to every armchair and in a pocket of every backpack. Richard Fleck is a retired English Professor. He has edited several volumes of writing by naturalists, including John Muir: Mountaineering Essays (University of Utah Press, 1997).